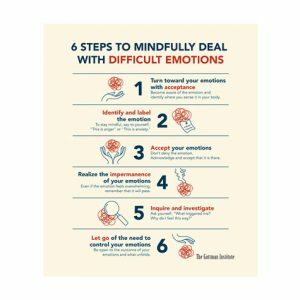 Download this printable poster and use it in your home, classroom, or practice as a reminder of the emotions possibly lurking below the surface. If you’re unsure of why you are feeling angry, it can be useful to think of anger like an iceberg. Only about 10% of an iceberg is visible, the rest of it is hidden below the surface of the water. Similarly, when we are angry, there can be other emotions hidden beneath the surface. It’s easy to see a person’s anger, but it can be difficult to see the underlying feelings the anger is protecting. Learning to recognize anger as a basic, valid emotion, and as a protector of our raw feelings, can be incredibly powerful. It can lead to healing conversations that allow couples, as well as children and parents, to understand each other better. Download this PDF poster and print it out for use at home, in the classroom, or in the office. The Gottman Institute (“TGI”) grants you a limited, nontransferable license to download the material and to copy and have copied the material for your personal and internal business use only. You may copy the material in any size or format, but may not otherwise modify or amend the material or distribute, sell, or publicly display copies of the material without the prior, written consent of TGI. Each copy of the material must include all copyright and other proprietary notices contained in the original. This license will terminate without notice if you fail to comply with its provisions or fail to pay any amount payable to TGI. TGI owns all right, title, and interest in the material and reserves all rights not expressly granted to you. The material is provided “as is” without warranty of any kind.